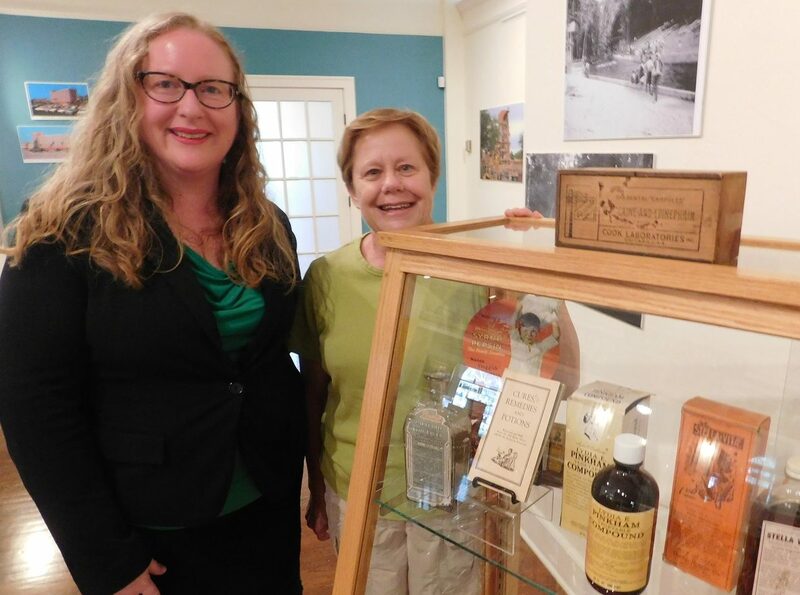 A new exhibit at the Matheson History Museum will cure your curiosity for knowledge about the storied history of medical practice in Gainesville and the region. 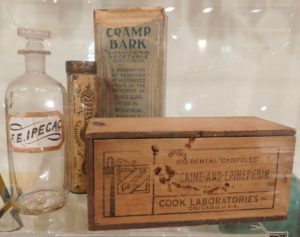 A display case in the Matheson History Museum’s newest exhibit holds a fascinating assortment of vintage tins, bottles and small cardboard boxes that once contained medications used to treat just about every malady. A midwife’s uniform from the early 20th century. One wooden box is imprinted with the words “Cocaine and Epinephrin” and once contained 100 capsules (or “carpules”) intended to treat toothaches. For obvious reasons, you won’t find such a product on today’s drugstore shelves. Another corner of the exhibit hall includes a midwife’s uniform from the 1930s. The white cotton dress has visible stains from the birthing duties once performed by its owner. Those are just two gems to be discovered in an informative exhibit titled “Medical Milestones: Transitions in Health and Wellness in Alachua County.” The exhibit opened this week and can be viewed Tuesdays through Saturdays from 11 a.m.-4 p.m. through Dec. 23 at the Matheson Museum, 513 E. University Ave. The exhibit, curated by Matheson Museum Executive Director Dr. Peggy Macdonald, examines the rich history of medicine in the area, including the use of nearby natural springs for their healing powers, the evolution of the medical community here, the founding and growing significance of the UF College of Medicine, and the rise of natural childbirth in and around Gainesville. Medical remedies from a bygone era. Stefanie Samara Hamblen, the Matheson Museum’s new coordinator of operations and visitor services, arranged to have the midwife’s dress displayed. Hamblen, also editor of the Hogtown HomeGrown newsletter, had three children with midwives. 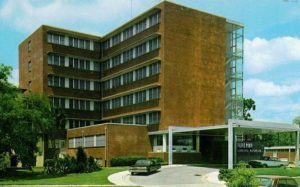 The Medical Milestones exhibit traces the history of Gainesville’s healthcare community, which for many years included four full-fledged hospitals in operation. “It was a wealth of riches for a small college town,” Macdonald said. One wall of the exhibit is dedicated to Alachua General Hospital, which closed in 2009 after serving the community for 80 years. The 367-bed hospital on Southwest 2nd Avenue and 10th Street was demolished to pave way for the UF Innovation Hub. However, the area’s healthcare history goes back much further than the hospitals. When noted naturalist William Bartram first explored Florida in the 1770s, he stopped to admire the many natural springs that abound in this area. He compared the refreshing waters to “the blue ether of another world.” Even before then, Florida’s earliest inhabitants considered the springs sacred. Florida achieved statehood in 1845, and it wasn’t long before people started flocking to the springs for their supposed healing powers. Spas were built along many of North Florida’s spring-fed rivers and above the springs themselves. In researching that aspect of the Medical Milestones exhibit, Macdonald often referred to fellow Gainesville High School alumnus Rick Kilby and his award-winning book, Finding the Fountain of Youth: Ponce de Leon and Florida’s Magical Waters. 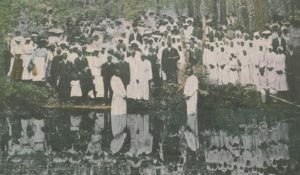 A baptism in the river. One thing the waters couldn’t quite deliver, however, was eternal youth. 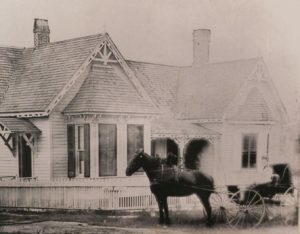 Dr. Sarah Robb in a horse-drawn buggy outside her house, which still stands on Southwest 2nd Avenue. Part of the Medical Milestones exhibit explains how northern doctors instructed patients to travel to Alachua County to “take the waters” of the springs as a cure for tuberculosis and other diseases. In 1882, Dr. Robert Robb traveled from South Carolina to Gainesville to recover from tuberculosis. In 1884, Dr. Sarah Robb joined him and they became Alachua County’s first husband-and-wife doctor team, offering conventional and homeopathic remedies. Dr. Robert Robb was instrumental in establishing the Odd Fellows Home, a tuberculosis sanitarium, in 1894. The old Robb House, at 235 SW 2nd Ave., now serves as home to the Alachua County Medical Society and its museum. 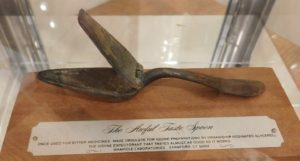 The Awful Taste Spoon … open wide! The University of Florida might not have been established in Gainesville in 1905 had community leaders not extended the promise of free water from nearby Boulware Springs as an incentive. A half-century later, the university established the state’s first medical school. This year, the UF Colleges of Medicine and Nursing are celebrating their 60th anniversary. Macdonald said the Medical Milestones exhibit is simply a glimpse of the area’s vast medical history. Hours: Tuesday-Saturday 11 a.m.-4 p.m.
For further info, visit the Matheson History Museum website.